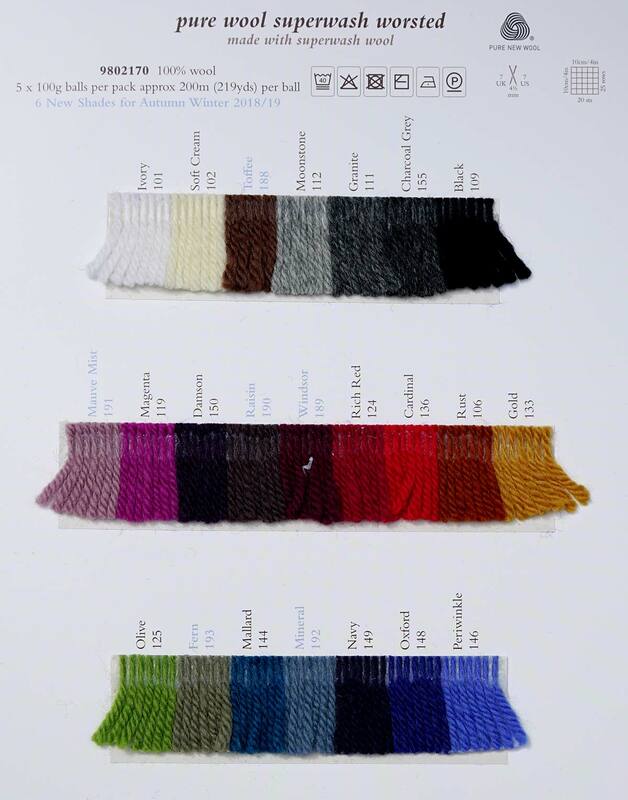 Yarn Type Soft 100% Wool, machine washable worsted weight yarn, available in 50 lovely shades ranging from soft neutrals to mid tone brights and deep darks. Knits to the same tension as Creative Focus Worsted. 100% super wash wool. (per ball) 200 metres (219 yards) per 100g ball. Machine washable (40 deg). This collection of seven patterns for women features bold designs knitted in our 100% wool Pure Wool Superwash Worsted yarn. Designed by Martin Storey it features sweaters, cardigans and accessory and techniques as varied as intarsia and cables. You can purchase the patterns individually at £4 each, or buy all 10 patterns as an entire collection here for £12.00. Or view the single patterns below. Crochet this granny square blanket, a free pattern download designed by Sarah Hatton and using the exciting Rowan Pure Wool Superwash Worsted (100% wool). A simple and colourful blanket that will add a lovely cosy feeling to any lounge or bedroom and is guaranteed to keep you warm on those cold winter nights. This crochet pattern is ideal for the beginner crocheter. Knit this striking homeware cushion from Rowan Knitting & Crochet Magazine 56 as an exclusive free download, a design by Martin Storey using the wonderfully soft machine washable worsted weight yarn (wool.) This square cushion has a geometric triangular design on both sides. This free pattern PDF has also been translated into French, German, and Dutch. Knit this homeware hot water bottle cover, a free pattern to download. Designed by Kristen Rettig using our wonderfully soft machine washable worsted weight yarn, Pure Wool Worsted (wool), this cover features chunky rib detail an the opening and a sweet owl design. Knit this ladies textured sweater, a free pattern to download as part of the Pure Wool Worsted Online Collection. Designed by Jodi Lewanda using the wonderfully soft machine washable worsted weight yarn, Pure Wool Worsted (wool), this pattern features broken rib to the sleeves and main body of the garment and a roll neck worked in offset rib. Knit these accessory cable hat and gloves, a free pattern to download as part of the Pure Wool Worsted Online Collection. Designed by Susan Mills using the wonderfully soft machine washable worsted weight yarn, Pure Wool Worsted (wool), one ball of yarn makes both the hat and fingerless gloves. Knit this accessory shoulder bag, a free pattern to download as part of the Pure Wool Worsted Online Collection. Designed by Melissa Mitchell using the wonderfully soft machine washable worsted weight yarn, Pure Wool Worsted (wool), this slouchy bag features an all over cable design and stocking stitch strap. Knit this pretty ladies sweater, a free pattern to download as part of the Pure Wool Worsted Online Collection. Designed by Kathy Zimmerman using the wonderfully soft machine washable worsted weight yarn, Pure Wool Worsted (wool), this knitting pattern features a delicate eyelet design and frilled edging. Knit this ladies sweater, a free pattern to download as part of the Pure Wool Worsted Online Collection. Designed by Susan Mills using our wonderfully soft machine washable worsted weight yarn (wool), this longline sweater features garter stitch ridge edges and a stand up round neck collar. Knit this childrens striped sweater, a free pattern to download as part of the Pure Wool Worsted Childrens Online Collection. Designed by Susan Mills using the wonderfully soft machine washable worsted weight yarn, Pure Wool Worsted (wool), this sweater is suitable for little boys and girls and is available in either a striped or colourblock version. Knit these simple childrens pullover and cardigan designs, free patterns to download as part of the Pure Wool Worsted Childrens Online Collection. Designed by Susan Mills using the wonderfully soft machine washable worsted weight yarn, Pure Wool Worsted (wool), these stocking stitch designs have contrasting garter stitch edges and are suitable for both boys and girls. Knit this childrens cable sweater, a free pattern to download as part of the Pure Wool Worsted Childrens Online Collection. Designed by Susan Mills using the wonderfully soft machine washable worsted weight yarn, Pure Wool Worsted (wool), this jumper has an all over cable design and can be knitted as either a solid colour or striped version. Knit this childrens cardigan and matching hat, a free pattern to download as part of the Pure Wool Worsted Childrens Online Collection. Using our wonderfully soft machine washable worsted weight yarn, Pure Wool Worsted (wool), this simple stocking cardigan and hat have a contrasting garter stitch edgings and colourful stripe sequence.